Shinzo Abe looks set to extend his leadership of Japan until 2021. What have been his successes so far and what will the continuation of ‘Abenomics’ mean for world’s third biggest economy and its neighbours? Shinzo Abe was re-elected this week for his third three-year term as leader of Japan’s ruling Liberal Democrat party (LDP), almost certainly securing his position as Prime Minister until 2021. If he remains in office through the summer of 2020, he will preside over the Olympics that he fought so hard to bring to Tokyo and will enter the history books as the longest serving Japanese prime minister, surpassing Eisaku Sato’s 2,798 days in office. Although political scandals tainted his first six years as prime minister, Abe and his cabinet have continuously seen solid public support as they introduced a new brand of economic policies dubbed ‘Abenomics’; a bundled approach of monetary easing, fiscal stimulus and structural reform. Despite continued foreign criticism, Abenomics has broadly been a success domestically: the unemployment rate is at a 25 year low, everyone who wants a job has one, wages are on the rise and corporate earnings and tax receipts are at record highs. The stock market has quietly been one of the best global performers since 2012, recently taking back the title of the world’s second largest stock market from China. With the help of his long-term allies; Chief Cabinet Secretary Suga, Finance Minister Aso and Bank of Japan Governor Kuroda, Abe has pulled Japan out of the slump that was triggered by the bursting of an asset bubble and the banking crisis that followed through the 90s. The additional three years in office that Abe has just won gives him the opportunity to try to close outstanding sensitive geopolitical issues; notably the North Korean abductions of Japanese citizens, the post-war Russian seizure of the Kuril Islands and the amendment of the Japanese constitution in order to legitimise its armed forces. Domestically, the unfinished business of labour reform and opening up the country further to immigrant workers to counter labour shortages, remain priorities. Since 2012 as the Abe government got to work, Japan’s working age population has fallen by 4.5 million but the numbers employed have risen by 2.5 million and there has been a doubling of foreign workers to around 1.3 million. Japan stands to lose around 500,000 from the workforce annually going forward and there are clear signals now that more foreign workers will be welcomed as long as the policy remains economic in nature. However, a new challenge is now unfolding: Trump’s trade war. 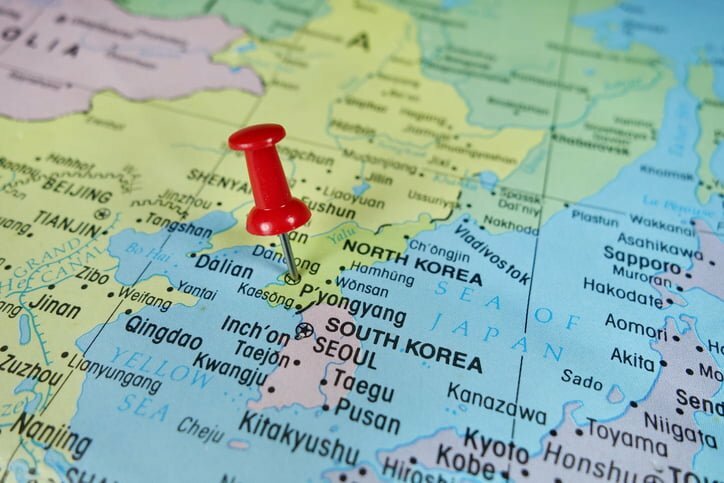 There is a growing school of thought that Japan is not really in the firing line (despite the rhetoric) and it could actually benefit from a trade war. Following an aggressive period of offshoring from 2012, over half of what the Japanese make and sell, is now actually made and sold overseas, allowing Japanese corporates to be very nimble and shift production of goods around to avoid tariffs. As the US becomes more insular, Japan has become more global, becoming the leader of free trade by pushing ahead with the trade Trans-Pacific Partnership (TPP) that Trump took the US out of, striking a deal with the EU and creating the framework for a post Brexit deal with the UK – which may eventually lead to Britain’s membership of the TPP. 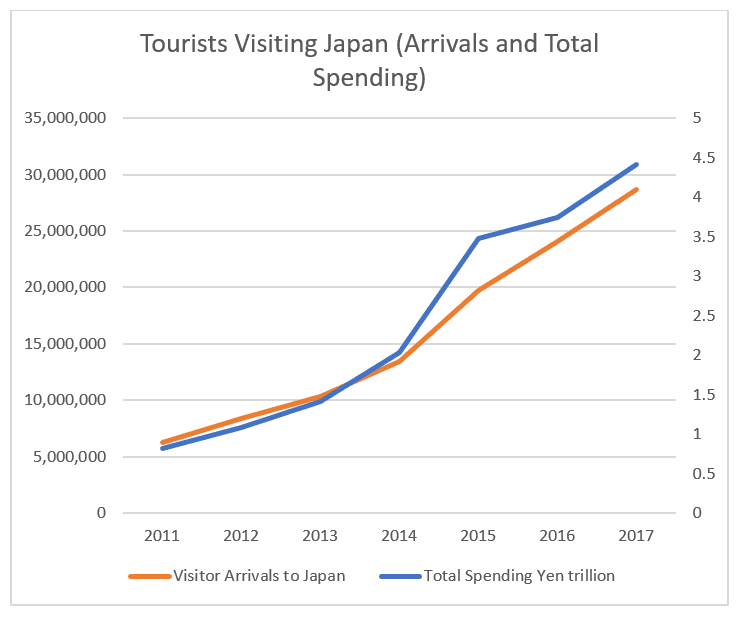 One of the most visible successes of Abenomics has been opening up access to Japan for many more Asian tourists. Almost from day one of the Abe administration in 2012, progressive relaxation of immigration procedures particularly for the Chinese and ASEAN visitors, deregulation of hotel standards and expanding airport landing slots, kicked off a tourism boom. Rebooting tourism has been core to Abe’s revitalisation plan, its aggressive target to boost visitors to 20 million annually by 2020 for the Olympics was reached by early 2016. With tourist arrivals at 28.6 million in 2017 and continuing to grow, the target was raised to 40 million by 2020 and 60 million by 2030. Foreign visitors now account for about ¥4.42 trillion of consumption, a small amount by national standards, but representative of 17% growth in the sector last year and noticeably impacting some regional economies. Central and regional governments are very pleased with the results although it has not been without its issues as tourist related businesses had historically operated on a small-scale, typically catering for just 6-8 million foreign visitors – about the number that visit the Eiffel Tower each year. Over a year has passed since the last cabinet reshuffle and although the timing is always kept a closely guarded secret, now that Abe’s position is secured, and likely finite this time, he will look for the opportunity to build a successor, reward supporters and punish his challengers. It will be interesting to see what role he will give to former defence secretary Shigeru Ishiba, his lone opponent in the election and a critic of Abenomics who recently said Abe’s performance so far had been down to ‘luck’. Whether lucky or prudent, with three more years of Abenomics now virtually guaranteed, the uncertainly surrounding a change in economic policies has been removed and arguably that should be comforting to corporates and investors who can look forward to a weak yen, a strong stock market and low volatility. The easy money policy put in place by the Bank of Japan (BoJ) will continue and although critics like to point to Japan’s huge government debt, it is worth remembering in that over 90% of it is owned domestically, much of it in the financial system, public pensions and individual’s savings, in which case there is every reason for the BoJ not to change course. Even using the misleading gross debt to GDP levels which alarmists like to point at, it is worth noting the total level of debt has now stabilised, and as a percentage of GDP, it has begun to fall.